At the last Phillips sale I was surprised to see the appearance of a spring loaded hook. This particular one was Swedish and I first came across this hook in the early 1970’s when I was doing my arctic warfare training in Norway. The idea was to bait the hook with a small baitfish, lower it into an ice hole and wait for a large pike to take the offering. Thus providing a meal, that was the theory. During the last year or so I have come across other spring loaded hooks and decided to do a little bit of digging to find what was available to the researcher. The results were disappointing, no one has written a book specifically on the subject the nearest to it being Identification Guide to Hooks & Harnesses by Thomas Minarik and Thomas Minarik jnr. This was printed in 1993 and is now out of print. Consequently I have decided to try and put together all that I have available in this article with the hope that someone will come forward in the future to complete the picture. Spring Snap Hook from the Complete Angler 1760 edition. I should have read his comments and taken note of them before I started to try and work out how the hooks and traps worked. He called them infernal machines of torture having no equal and the way to find out was to get one in your hand. This is what I did on a few occasions, the worst being one Sunday night at my local pub when a friend insisted he knew how they worked only to succeed in getting three very large iron prongs into his hand. This was followed by a trip to the doctors the next day for a tetanus injection! As I have said before most people who fished in the 19th. Century did so for the table. Myself I have an open mind and would remind the detractors that the first “spring-snap” hook appears in the 1760 edition of Isaak Walton’s Complete Angler. This hook was available for many years in England and I remember seeing it in a tackle catalogue issued around the turn of the 19th century. 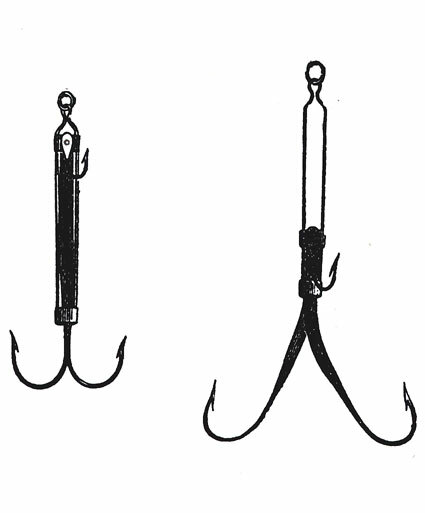 The first patent for a spring loaded hook was issued in 1846 to Theodore Engelbrecht and George Skiff of New York. It consisted of a hook fitted with a spring loaded lever curved and sharpened at one end. 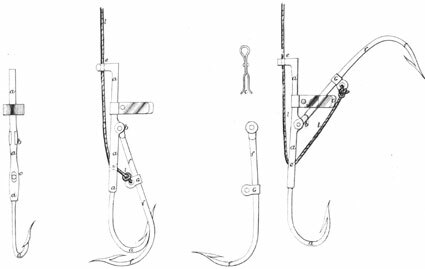 One year later another patent was granted to Stanton Pendleton from New Haven Connecticut for his improvement to the Engelbrecht-Skiff patent by offering the chance to change the hook. In 1847 the most famous of the spring hooks was invented by Job Johnson of Brooklyn New York. At the time of his patent application he was an Englishman in the process of applying for American citizenship. He reported his occupation as a hook maker and would possibly have originated from Redditch, a fact I am in the process of checking. The difference in the two hooks was that in place of the loaded lever Johnson had fitted a spring coil. This is a very important item of tackle as it is possibly the oldest patented piece of tackle available to the collector today. In Britain we have to wait until 1856 for Kenton’s patent reel to appear and I know of no one who owns this. 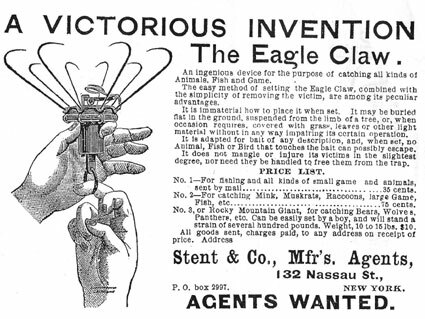 The Sockdolager had a very long production run and was advertised in the Sears Roebuck & Co. catalogue in 1900. Once the patent had expired a few other companies started to make it and I have seen one or two variations on the original hook. 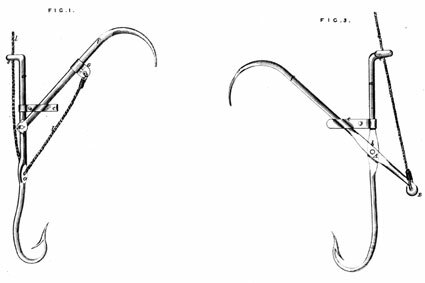 The first patent for a British device of this type was granted in January 1867 and is called “Gedge’s Patent Two branch or Double-hooked Fish-hook”. This device has no springs fitted but does work on a lever principle. The biggest surprise is the fact that it was a Frenchman who invented it and Gedge was a Patent Agent working on his behalf. The inventor was Francois Angilard junior of 39 Faubourg St. Martin Paris. Has anyone ever heard of him? There are two sets of drawings with the patent, and to me it looks like there was some thinking on the hoof due to the number of changes made in the specification and the drawings. Provision Drawing for Gedge's patent. In the provisional drawings we have two hooks one of which is fitted in the body of a block, the top of which is bent and drilled so that the line can pass through it. The idea is that when the fish takes the bait with the stationary hook it causes traction on the line forcing the lever hook into the body of the fish. It was claimed that the wounded fish would rapidly loose it’s strength and so make it easier to extract it from the water. By the time that the final drawings had been submitted there was another major change to the hook design. The stationary hook was now made from one piece, with line coming into the hook through a pierced hole and through another pierced hole in the shank of the hook. Now was Mr. Angilard aware that further improvements were possible? Or did he have no idea if his original design would work. Final Drawing showing the two options available. In fig. 2 we see another version of the hook. The hole where the line enters has now been formed like a regular hook eyelet. The hole in the hook shank has been replaced and the movable hook has been replaced with a much longer one. Gedge's patent Hook in the closed position. Has anyone ever seen one of these hooks? I recently came across what I at first identified as a Sockdolager, however on closer inspection it did not quite follow the original design. The original item has two hooks and a spring attached to a bar. In the second the bar has been combined into a hook. This modified Sockdolager came from Northern Europe where spring hooks and traps were very common. Possibly the second most famous hook is the Eagle Claw . I have never held one in my hand and from the pictures I would have some trepidation in doing so. On page 2 is a copy of the advert when it was launched in 1877. I note that one was available to trap bears WOW! I have over the last few months seen many variations on the spring hook and will during the next year show some of them. This entry was posted in Spring & Lever Hooks. Bookmark the permalink. Hi there yes they are outlawed in many countries. Do you have any pictures of the items? There is a pretty good book covering these types of fishing hooks by a chap called Jeff Kieny called Patented Hooks, Harness and Bait Holders published in the USA. I have recently aquired a few of the items from his book with certification. I am intrigued by the range of items which were made even up to the fairly modern “Gaddsaxar” as they are known in Scandinavian countries. I am always on the lookout for strange and unusual hook mechanisms as I alway think it is the hook that actually gets you the fish – not the line, reel or rod!! If yours are for sale Brian or anyone has any of these items for sale, please mail me on mikfox2008@yahoo.com. Here is a link for everybody to where you can get the book. I have several “Sring Hooks” for sale. Made in Sweeden.